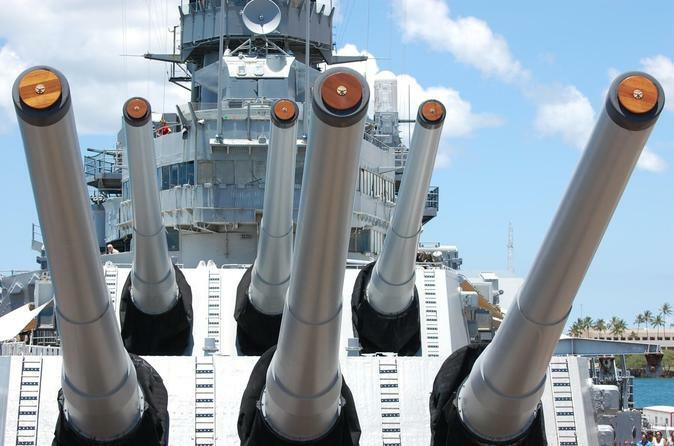 Enjoy a fast, easy and hassle-free visit to see the sights at Pearl Harbor. Skip the line for the USS 'Arizona' memorial, and transport is included to Pearl Harbor from any Waikiki hotel. This package includes tickets to the USS 'Arizona' memorial, USS 'Bowfin,' as well as the USS 'Missouri.' You'll also gain access to the USS 'Oklahoma' memorial, and at the end of this 7-hour, small group tour, take a short journey past popular downtown Honolulu sights. You'll meet your driver at 8am at the door of your Waikiki hotel, and be chauffeured to the Pearl Harbor entrance to get entry tickets from your supervisor. Enjoy a bottle of cold water or a refreshing tropical juice, and hear a basic orientation to all the Pearl Harbor sights. Your ticket includes entry to the USS Arizona memorial and the USS Missouri battleship, as well as entry to the USS Bowfin and USS Bowfin museum. You'll receive a narrated tour via headset for many of the Pearl Harbor sights, as well as get the chance to view footage from the morning of the Japanese attack. Hear the stories of the sailors who lived through the harrowing morning explosions, and pay your respects to those who gave their lives while serving their country. At the end of this 7-hour, small group tour, you'll drive past many of Honolulu's most popular downtown sights, including the statue of King Kamehameha and 'Iolani Palace. You'll finish the tour when your driver returns the door of your Waikiki hotel.